Find out just how much $7 a day can do in this meal planner and cookbook for people with diabetes. 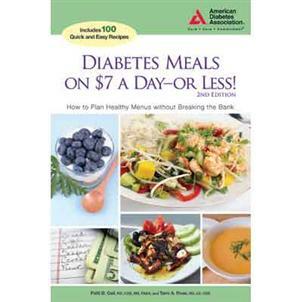 Would you believe it if someone told you that you could eat healthy, tasty, diabetes-friendly meals on just $7 a day? It sounds impossible, but it isn’t. You can save money without sacrificing what’s most important to you: a healthy variety of great-tasting meals that fits any diabetes meal plan. Authors Geil and Ross give you a slew of new, low-cost recipes, complete with cost-per-serving and nutrition information, and useful tips to help you navigate the grocery store shelves.